With Next-gen Armortex®-backed palms, these gloves offer hands extreme cut protection. 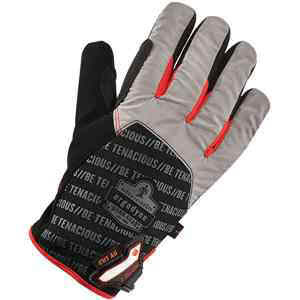 And they're insulated and weather resistant to keep hands warm and dry. Their contrasting gray fingertips also come handy for hand signaling. Other features include synthetic leather palms, reinforced thumb saddles, and hook-and-loop closures with ID space. Pull-on tabs and thumb nose/brow wipes are standard too. EN 388: 2543 F; ANSI/ASTM Cut Level A6. Black. Thermal Utility + Cut Resistance Gloves: Next-gen Armortex® delivers ANSI/ASTM Level A6 cut protection with insulated fill for cold weather work.